It seems like the Sitecore with Solr configuration and provider code are still in their toddler stages, there are a few quirks, however, it seems as Sitecore is working hard on fixing them. Again, following on of the best practices of Sitecore development – sharing the found bugs, I rushed to publish this quick article describing one of the issues that I ran into recently setting up a Solr solution for a client. The bug is related to the Web API DateTime calls and the new Media Library SPEAK browsing client interface. 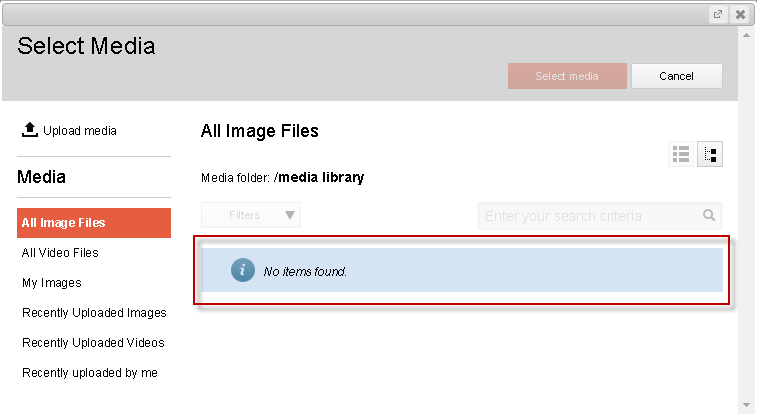 Missing Media Library items when using Sitecore with Solr. After following the steps outlined in the Sitecore Search Scaling Guide to setup Solr on my local development environment everything seemed to work fine, besides the Image Field Browse button, which when clicked did not show any Media Library items. Sitecore 7.1 has introduced a new SPEAK interface for browsing assets in the Media Library using search (Sitecore is undergoing a facelift, slowly replacing the XAML UI dialogs with more conventional HTML SPEAK framework). ERROR [Item Web API] String was not recognized as a valid DateTime. Message: String was not recognized as a valid DateTime. We have not tested other types of fields that use the same browsing functionality, however, it is likely that those fields would experience the exact same problem with missing Media Library items that get pulled in by the search with Solr. So if you are one of the developers that got to setup Solr with Sitecore 7-7.1, and are affected by the same but – read on! After some time of digging through the search dlls with a reflector, the root of the issue seemed to be located in the ContentSearch provider. I have contacted the Sitecore Support and they were very quick to recognize the bug and provide the solution. Unfortunately, as usually, there is no ETA on the fix being included in the Sitecore build, until, then the fix below should do the trick (with that being said there is no knowing which future updates to Sitecore will continue to have this bug, therefore, although we are currently talking about Sitecore 7.0 – 7.1 being affected, future releases might be as well). After following the steps above, the Media Library SPEAK search browser should display the media items and the Web API errors should go away as well, boom! Hopefully, this post will save many hours of frustration or days of troubleshooting to others, so please share this article, as many developers will thank you. Also remember to comment on this article, especially if you were affected by the same bug and this fix worked for you; please mention the version and revision of Sitecore you experienced the same problem on. Finally, give back by blogging, tweeting, and posting on Sitecore forums about any bugs and fixes you find yourself! It might be worth saying that if you applied the previous fix: http://www.cmsbestpractices.com/sitecore-fix-media-library-search-browser-speak-show-files-with-solr/ then you need to replace it with this one when you go up to Sitecore 7.2 Update 2.